With this property water reed ridge rolls were laid along the length of the ridge in order to gain more height and to give a firm, central fixing. 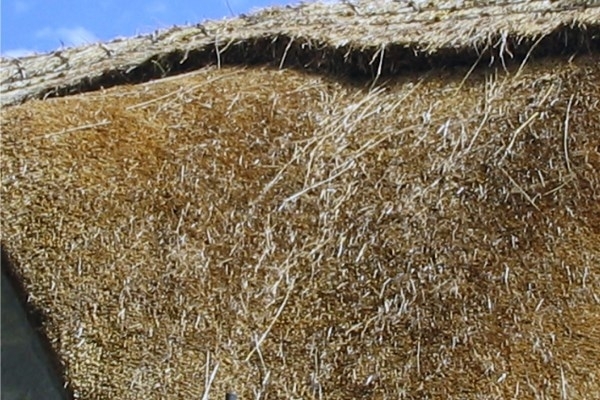 The ridge is created by laying ‘skirts and reverse’ which is an additional layer of thatch that provides further protection for the roof over the water reed. Once the thickness of this is consistent, ‘yealm’ is bent and laid on top to form the final cover. Yealm is then cut and decorated using ‘hazel spars’ to produce the detailed pattern on the ridge. This pattern work is both cosmetic and practical as it binds the ridge ensuring that the thatch is tight and secure and thereby reducing weathering. The skill is ensuring it is both level and straight no matter where it is viewed from.